1. Despite the fact that the recipe says the squash can be roasted ahead of time and eaten at room temperature, I would have preferred it warm. Next time, I’ll roast and then immediately use it. It tasted fine at room temperature and you might like it that way too, I just think I’d like the topping to be warm! 2. Chop the sage. The presentation of the whole sage leaf is appealing, but it makes it difficult to eat. Next time I’d chop the sage (I may even skip the frying sage) and instead sprinkle the crostini with the chopped herb. 3. Goat cheese. I actually really liked the lemon zested ricotta and would use it again…but I also think this appetizer would be really good topped with goat cheese, my all-time favorite! So there you have it, a solid appetizer for this type of year, but one that’s flexible enough to be changed according to your preferences. If you make it, let me know what variation you try! 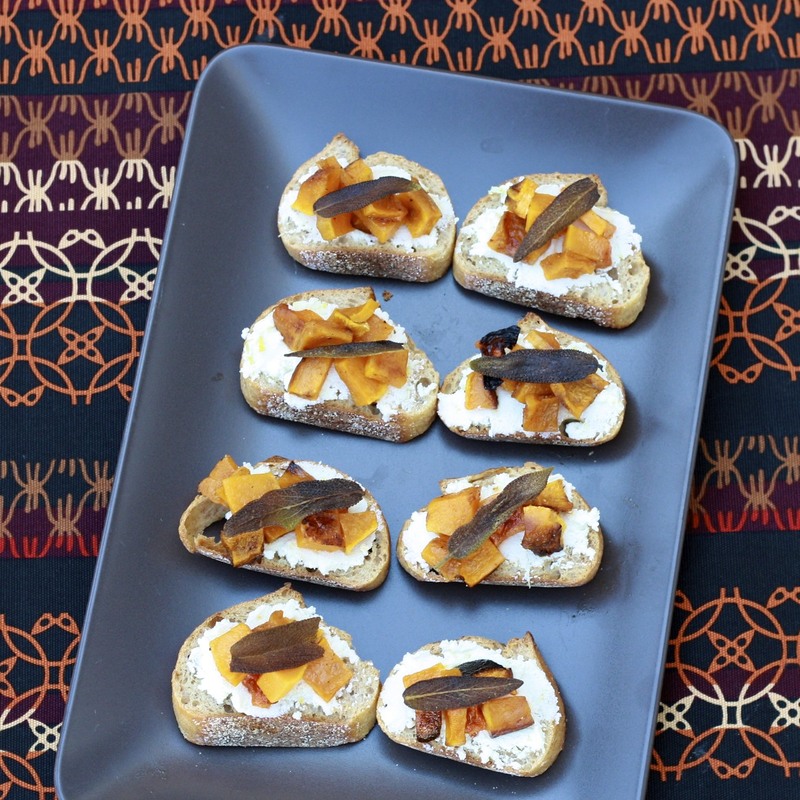 Looking for other crostini-type appetizers? 1. Preheat oven to 425F. Toss squash, 2 tbsp oil, and sugar in a large bowl. Season with salt and pepper and arrange in a single layer on a rimmed baking sheet. Roast, tossing occasionally, for 25-30 minutes (squash should be golden and tender). Allow to cool on the baking sheet. 2. In a small skillet, heat 1 1/2 tbsp oil and add sage, cooking until edges begin to curl and turn dark green (1-2 minutes). Remove sage leaves with a slotted spoon and place on paper towels to drain. 3. Mix ricotta and lemon zest in a small bowl. Season with salt and pepper. (Steps 1-3 can be done 1 day ahead of time. Cover and chill squash. Store sage airtight at room temperature. Cover and chill ricotta. Bring squash to room temperature before serving). 4. 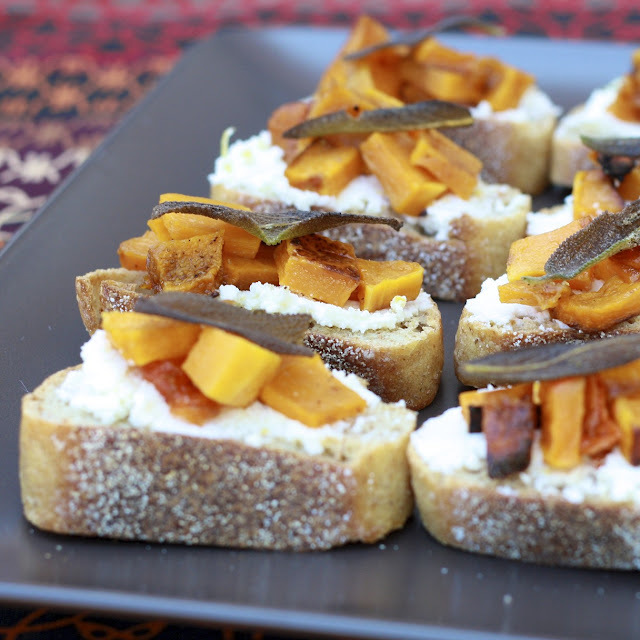 Spread 1 tbsp ricotta on each baguette. Top each with a few squash cubes and drizzle with lemon juice and olive oil. Sprinkle with salt and pepper and top with fried sage leaves.